There’s quite a lot happening in skies this month: A large asteroid will zip by the Earth, you can easily see the mighty planets Jupiter and Saturn, Mercury and Mars can be found next to each other right after sunset, the constellation Orion and its famous nebula are in a prime position for evening viewing … plus, there’s a comet on the way! A large asteroid will fly really close by Earth February 15, near the low Earth orbits (LEO) in which our Name A Star Live satellites typically fly. The asteroid — called “2012 DA14” — is about the size of a gymnasium. It will fly approximately 18,000 miles (28,500 kilometers) from Earth’s surface. That’s really close: By comparison, geostationary satellites used to transmit television signals to people’s homes orbit the Earth at about 22,000 miles (38,000 kilometers). However, scientists assure us that there is no chance of the asteroid hitting Earth. Name A Star Live’s Orbital Archives of star names typically fly in Low Earth Orbit (LEO) — see the white dot just above the Earth image in this diagram. 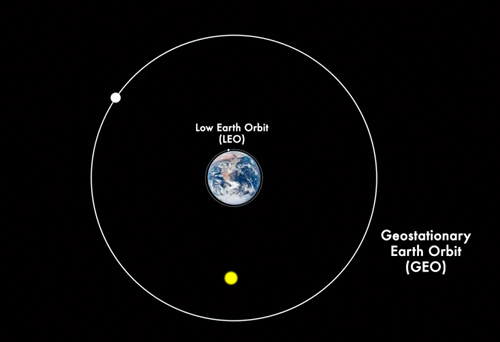 The asteroid (yellow dot) will fly between satellites in LEO and satellites in Geostationary Earth Orbit (GEO), which are approximately 22,236 miles (35,785 kilometers) above the Earth. The asteroid will fly through the Name A Star Live constellations Virgo, Leo, Ursa Major and Ursa Minor. Because the asteroid will be traveling so fast and so near the Earth, it will be very difficult to view. You would need a telescope in order to see it, but due to the asteroid’s speed it will be difficult to track the asteroid with the typical amateur telescope. In other words, even if you could find the asteroid in your telescope, the odds are it would move very quickly out of your field of view. But assuming you had a telescope with above average tracking ability, then those of you living from Eastern Europe, east, to Australia would have the only significant chance of seeing the asteroid as it will fly past you during your nighttime hours. Those of us in other parts of the world (such as North America, South America and Western Europe) are out of luck as the asteroid will fly by us during daytime hours. See NASA’s really neat video about this record setting asteroid flyby! But We’ll Probably Get to See a Comet Next Month! In March, astronomers believe we may very well get to see “Comet PanSTARRS”. Unlike this month’s asteroid, Comet PanSTARRS could be viewable with the naked eye (i.e., no telescope or binoculars required). Warning: It’s difficult to predict how bright a comet will become. But this one stands a good chance of being a standout! We’ll have more to say about this comet in next month’s blog. Jupiter is in the constellation Taurus throughout February: It’s easy to spot near the V-shaped group of stars in Taurus, marked by the bright, red star Aldebaran. Aldebaran comes from the Arabic, meaning “the follower” as Aldebaran appears to follow the Pleiades star cluster throughout the course of the night. 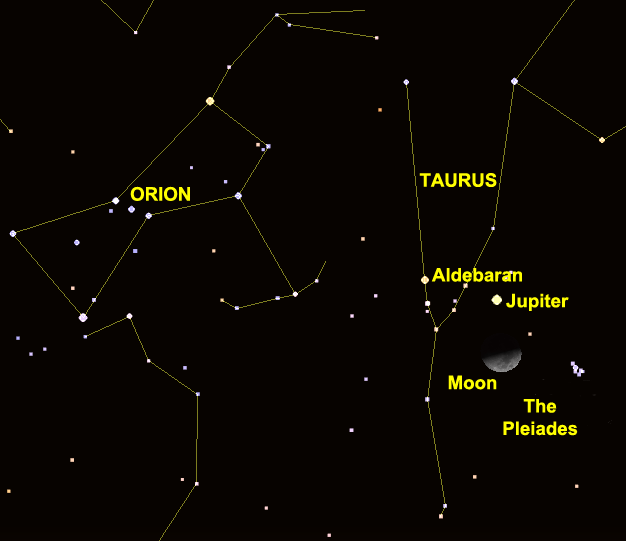 You can use the Moon to find Jupiter on the night of February 17, depicted in this image. The Moon will be in the constellation Taurus that evening. Look for the bright point of light near the Moon — that’s the planet Jupiter. Take a look at Jupiter through just about any telescope and you’ll likely see up to four of Jupiter’s large moons! Nearby are “The Pleiades” star cluster. Many people mistake this group of stars for the “Little Dipper,” which is actually in another constellation (“Ursa Minor”). You can also get a good view of the nearby constellation Orion. February is also a good month this year to see the elusive planet Mercury. Mercury never rises very high in the night sky, but you can see it this month shortly after sunset. Be sure to look for Mercury during the first half, or so, of the month as Mercury retreats back into the sun’s glare by the end of the month. 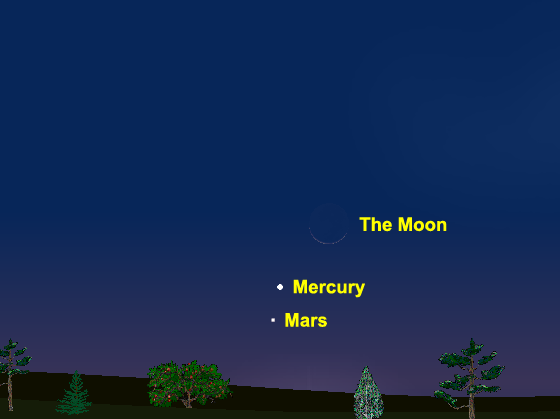 You can use the thin, crescent Moon shortly after sunset February 11 to find the planets Mercury and Mars. All three objects will be above the western horizon.